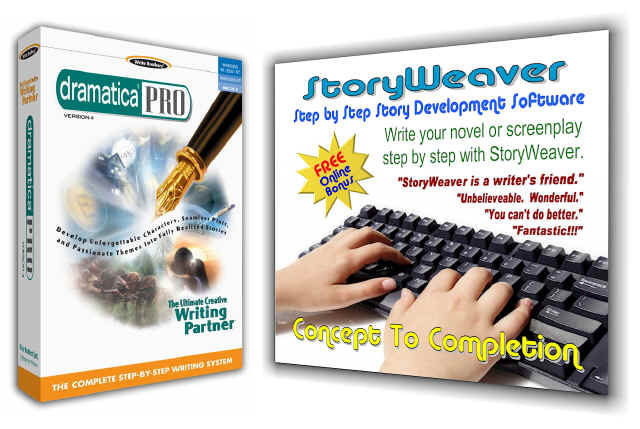 Writing Software - Does Dramatica Limit Your Story? Thanks for the comment, but that is simply not true. Then, perhaps I can find a way for the software to better present itself. Dramatica DOES have a "Story Engine" which is designed to make suggestions about how to strengthen and make more complete the structure of your story. There is a place for you to fill in whatever information you want to write about each of the story points. So, you might write in the space next to Goal, "The Goal of the story is to retrieve the stolen diamonds." Or, you might write, "The Goal is for Joe to find true love." What you write is up to you - no limitations. And you can fill in only those story points in which your interested, ignoring the rest. Now that you have "de-briefed" yourself about all of the ideas that are attracting you to your story, it can be useful to see what kind of a structure you are creating, and also perhaps to find some missing parts in the overall logistic mechanism of your story. There, you can create as many scenes or chapter as you like with the click of a button. Each scene becomes a separate window that is like a high-tech 3x5 card. There is a top part to the window where you describe how the scene unfolds and a bottom part where you can refer to your notes. What notes are these? The ones you created in Story Points, and in other places where you describe what you have in mind. You can arrange and re-arrange the "cards" in any order and they automatically re-number themselves, keeping the drudgery out of the process. But, if you WANT to get some structural suggestions, then and ONLY then, do you fire up the Story Engine. The Story Engine is what makes Dramatica different from any other software tool for writers - BUT, you don’t have to use it!!! It is an addition to the utilities, not the only thing the software does. With whichever story point you begin, you will be presented with a little list different kinds of subject matter. So, if you started with Goal as the most important story point to you, you might have already written in Story Points "The Goal is to retrieve the stolen diamonds." Now, you refer to your words and compare them to the lists of kinds of subject matter. You pick the item or items that best describes the underlying structural significance of what you have already written. When none of the available choices match what you already creatively wrote, the Story Engine is telling you that it "believes" this particular story point is thematically inconsistent with what you’ve already told it about earlier story points. You have a choice. You might look at what the Story Engine suggested and say, "Hey, that makes more sense." And then you might rewrite how you intended to put that story point into play in your story. But, you might just as well say, "Hey, that doesn’t make any sense at all," and leave things just as they are. Dramatica won’t "force" you to change your words. It just offered you a suggestion, like any good writing partner. But it’s your story, do what feels right to you! The third possibility is that you might say, "Hey, Dramatica’s suggestions make better sense, but they don’t inspire me. If I write it to have a stronger structure, I’m sure it will come out dry. But the way I originally had it was very exciting to me, even though I can now see that it isn’t as strong as it could be structurally. Still, if I write it the way I originally wanted, I’ll be so enthusiastic that it will really come to life and the minor detriment to the structure will be more than compensated for by the added energy." 1. The software has MUCH more to offer than the Story Engine. 2. You don’t have to even use the Story Engine for Dramatica to be a really useful tool. 3. The Story Engine just makes suggestions to help alert you to potential weaknesses in your structure. 4. What you do about those suggestions is completely up to you.